CUPERTINO, California—September 10, 2013—Apple today introduced iPhone 5c, featuring an all-new design, packed with incredible features in five gorgeous colors. The new iPhone 5C comes in Blue, Green, Pink, Yellow and White. iPhone 5c is built on a foundation of features people know and love. iPhone 5c comes with more LTE bands than any other smartphone in the world, a new FaceTime HD camera and iOS 7, the most significant iOS update since the original iPhone. “iPhone 5c is everything iPhone 5 was and more, in an all-new design packed with great features,” said Philip Schiller, Apple’s senior vice president of Worldwide Marketing. “iPhone 5c is designed with a beautiful polycarbonate enclosure that looks and feels so solid in your hand.” iPhone 5c features an all-new design crafted from a single, hard-coated polycarbonate body with a steel reinforced frame for a solid, sturdy feel. The steel frame of iPhone holds the internal components and also doubles as the iPhone 5c’s multiband antenna. The enclosure is one continuous and seamless structure that is finished with a hard coat for a durable and incredibly glossy surface. To complement the all-new iPhone 5c design, Apple created soft, matte, microfiber-lined cases in a very intentional contrast to the glossy, with a great hard coat finish. These sleek silicon cases with unique circular patterns let splashes of color show through, and with five iPhone 5c colors and 6 cases to choose from, Users can mix and match for dozens of crazy and fun combinations. iPhone 5c comes with all the features customers love in iPhone 5, and more. The Apple-designed A6 chip provides incredible performance and power efficiency, all while delivering great battery life, so almost everything you do on iPhone 5c is blazing fast, from launching apps and loading web pages to downloading email attachments. iPhone 5c features a stunning 4-inch Retina display and an 8 megapixel iSight camera, the most popular camera in the world. iPhone 5c also includes a new FaceTime HD camera for even better FaceTime calls and self-portraits and with iOS 7, you can make audio-only FaceTime calls for the first time. iPhone 5c makes it even easier to connect to high-speed networks with support for up to 13 LTE wireless bands, more than any other smartphone in the world. With download speeds up to 100 Mbps, users can browse, stream and download content even more faster. iPhone 5c includes dual-band 802.11 a/b/g/n Wi-Fi support for up to 150 Mbps and Bluetooth 4.0.
iPhone 5c comes with iOS 7, the most significant iOS update since the original iPhone, featuring a stunning new user interface, completely redesigned with an elegant color palette, distinct, functional layers and subtle motion that make it feel more alive. iOS 7 is designed to complement the gorgeous exteriors of iPhone 5c, with matching wallpapers and translucency that carry the color through the entire experience. Introduces iTunes Radio, a free Internet radio service based on the music you listen to on iTunes. iPhone 5c customers have access to the revolutionary App Store, which offers more than 900,000 apps to iPhone, iPad and iPod touch users in 155 countries around the world. More than 50 billion apps have been downloaded from the App Store to date, offering customers an incredible range of apps in 23 categories, including newspapers and magazines in News stand, games and entertainment, business, news, sports, health and fitness and travel. Designed specifically for iOS, iPhoto, iMovie®, Pages, Numbers and Keynote are among the most popular apps in the App Store and are now available as free downloads with the purchase of iPhone 5c. iPhoto and iMovie enable you to do more than you ever thought possible with your photos and movies, and with Pages, Numbers and Keynote you can create, edit and share stunning documents, spreadsheets and presentations on your iPhone, iPad or iPod touch. iPhone 5c will be available in the US for a suggested retail price of $99 (US) for the 16GB model and $199 (US) for the 32GB model. 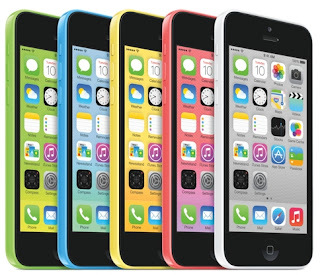 iPhone 5c will be available from the Apple Online Store (www.apple.com), Apple’s retail stores, and through AT&T, Sprint, T-Mobile, Verizon Wireless and select Apple Authorized Resellers. iPhone 5c cases will be available in blue, green, pink, yellow, black and white for a suggested retail price of $29 (US) through the Apple Online Store (www.apple.com), Apple’s retail stores and select Apple Authorized Resellers. iPhone 5c will be available in the US, Australia, Canada, China, France, Germany, Hong Kong, Japan, Puerto Rico, Singapore and the UK on Friday, September 20, and customers can pre-order their iPhone 5c beginning Friday, September 13. A new iPhone 4S 8GB model will also be available for free. iOS 7 will be available as a free software update starting on Wednesday, September 18 for iPhone 4 and later, iPad 2 and later, iPad mini and iPod touch (fifth generation). Some features may not be available on all products. Based on theoretical speeds, actual speeds may vary.